This B&H Kit combines the Native Instruments TRAKTOR KONTROL S4-MK2 with a pair of DJ headphones to create a professional DJ setup for mobile DJs and home enthusiasts. The S4-MK2 is designed for DJs and electronic music performers that use TRAKTOR DJ software and features aircraft-grade aluminum jog wheel plates, improved fader reliability, RGB color coded buttons for visual feedback when triggering cue points, samples, and loops, as well as full support for the iPad and iPhone TRAKTOR DJ application. 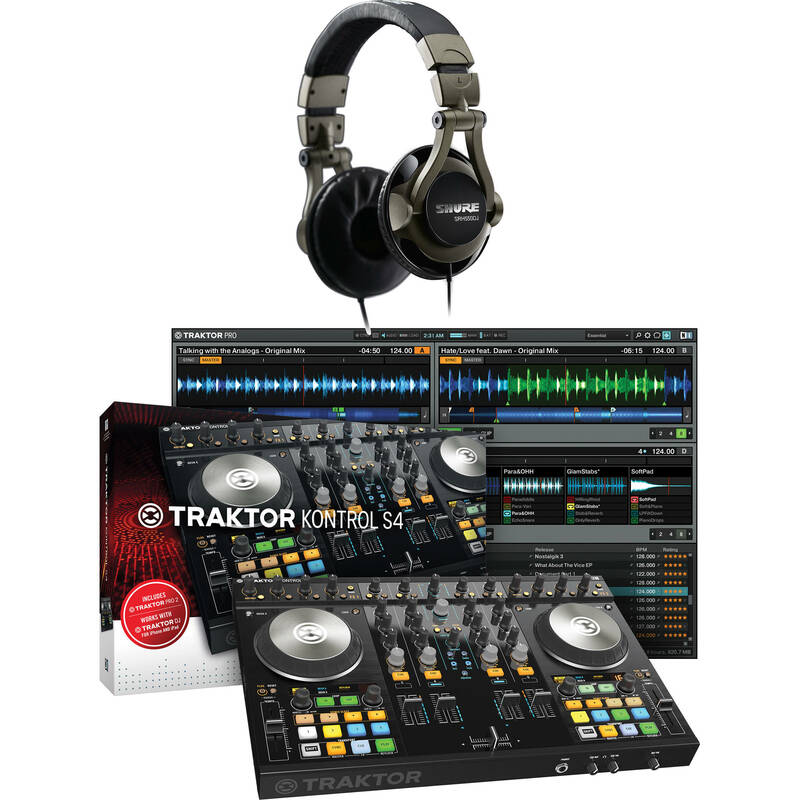 The unit consists of a three components: a software controller that mirrors the control interface of TRAKTOR PRO 2 DJ software, a 4-channel mixer with 3-band EQ and additional channel for remixing, and a Cirrus Logic AD/DA audio interface with 24-bit 96kHz resolution. The professional quality DJ headphones deliver the comfort, sound and style expected by professional nightclub, mobile and home DJs alike. The headphones feature 50mm drivers with full bass response, and supra-aural earcups for superb isolation and monitoring. The earcups swivel 90° for comfortable single-ear monitoring. The Shure SRH550DJ Professional Quality DJ Headphones deliver the comfort, sound and style expected by professional nightclub, mobile and home DJs alike. The SRH550DJ headphones feature 50mm drivers with full bass response, and supra-aural earcups for superb isolation and monitoring. The earcups swivel 90° for comfortable single-ear monitoring. The cable terminates to an 1/8" (3.5mm) connection, and a 1/4" phone adapter is supplied. Also provided are replacement ear pads and a storage pouch. Box Dimensions (LxWxH) 11.3 x 9.3 x 4.9"